"As a child he learned to play the violin, and later, as a teenager in the school orchestra, he loved the sound of the cello so much that he decided to learn the cello. He studied music in Berlin, and began his career in 1929 as the cellist in the Bruinier Quartet. He performed in concerts in Germany and other parts of Europe with the Bruinier Quartet from 1929 to 1933. He also played in the Tobis Film orchestra and the Funkstunde orchestra. From 1933 to 1938 he played in the concerts of the Jewish Kulturebund in Nazi Germany, and was the cellist in the Mendelssohn Trio. He married Lotte Samter in October 1937. They managed to emigrate from Germany in June 1939, and settled in London. "Paul succeeded in continuing his career as a professional cellist in London. In 1943 and 1944 he played in the London Polish String Quartet. From 1945 to 1954 he was a member of the orchestra of the Sadler's Wells Opera. Later, he became a member of the Ballet Rambert Orchestra. Over the years he also gave cello lessons, and played in numerous concerts in London at the Association of Jewish Refugees (AJR) Club, the B'nai B'rith Leo Baeck Lodge, and the Belsize Square Synagogue. He also gave concerts for the residents at the Leo Baeck House and Osmond House. 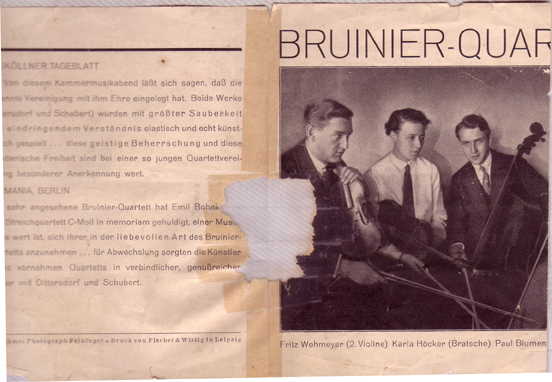 The clipping below from Leipzig that he sent to his cousin in New York (my father) depicts three of the four members of the Bruinier Quartet. He married Charlotte Samter on 31 October 1937 in Berlin. Paul had a son Dennis Blumenfeld who now lives in Michigan. Dennis visited his cousin Walter in Australia while on his honeymoon around 1977, saw him several times in London, and celebrated his father's 100th birthday with the family. Dennis wrote, "As a devoted father and grandfather, Paul has always enjoyed family life. He and Lotte celebrated their 50th wedding anniversary in 1987." I have two letters apparently saved by my father that Julius and Paul wrote to his aunt Ella Cohen (nee Recha Blumenfeld) in care of another nephew Dr, Martin Klein, with whom she was living. I do not know how the letters came into my father's possession. Although Paul wrote in latin German script, the annotations on the letter by his father Julius Blumenfeld were in the old German script. (The old German script was transcribed by a group in Hamburg which has a Website www.suetterlinstube.de. hat & soll man in solchen Fällen sich immer den Ärzten anvertrauen, selbst bei leichten Anlässen verstehen sie immer weit mehr als der Laie! - Unser Paul ist jetzt mit seiner Frau Gese -- auch hier & sind wir nun wieder alle beisammen. Du kannst Dir denken, daß wir mit unseren Kindern täglich zusammen sind, mal bei ihnen zum Tee - sie wohnen 5 Minuten ent-fernt - und mal in unserer Wohnung und fühlen wir uns alle sehr glücklich; wie schön wäre es, wenn Du, liebe Recha auch bei unseren Zusammenkünften auch dabei sein würdest! - Den To-desfall Simon Bergmann haben wir mit gr. Betrübnis vernommen, wir haben an Frau Anna Bergmann ein Condolenzschreiben gesandt; n. 122 E.42 Str. (das ist wohl die Geschäftsadres-se, eine andere Adresse haben wir nicht.) Daß er ein großes Vermögen hinterlassen hat, will ich glauben. Wie ist es denn nun mit dem Affidavit (Bescheinigung an Eides Statt), welches der Verstorbene für unseren Paul ausgestellt hat? Zwar würde die Nummer für Paul noch lange nicht an die Reihe kommen, aber ich möchte doch wissen, ob das Affidavit durch den Todesfall ungültig geworden ist, oder ob die Erben das Affidavit übernehmen. Vielleicht kannst Du Dich gelegentlich darnach erkundigen. - Von Natorp ist es seit vielen Jahren eine fixe Idee, daß Du solche große Summe besitzest, ich weiß es besser; nur eine (0) Null fort & Du & ich würden sehr froh darüber. Daß Du aber 10 Pfund abgenommen hast, habe ich mit großer Betrübnis gelesen & hat Martin K. Recht, wenn er Dir ratet viel Milch und Rahm zu trinken. Ich möchte gerne Dein jetziges Gewicht wissen und bitte Dich, mir dies in Deiner Antwort mitzutei-len, aber vergiß es nicht, Recha, - ferner hast Du mir nicht meine Frage nicht beantwortet, ob Natorps Sohn mit ausgewandert ist, oder ob er noch in Zürich geblieben ist. Hast Du Nat. nach seinem Sohn näheres gefragt, oder hat er Dir einiges von seinem Sohn erzählt? With much joy, we received your last letter of the 24. I hope that your ailment is completely alleviated now; I am happy that Martin Klein helped you & in such cases one should always trust the physicians, even for simple ailments, far always far more than the layman! - Our Paul also is here now with his wife Gese [Lotte] & now we are all together again. You can imagine that we get with together our children daily, sometimes for tea with them - they live 5 minutes away - and sometimes in our house, and we all feel very happy for ourselves; how wonderful it would be if you, dear Recha could also join our gatherings. When we heard with great sadness about the death of Simon Bergmann, we sent condolence letter to Mrs. Anna Bergmann at. 122 E. 42 Street (which is the business address; we don't have any other address.) I want to believe that he has left a large fortune. What is the situation with the affidavit (his certification under oath) which the deceased [Simon Bergmann] issued for our Paul? Certainly the number for Paul would not come up for a long time, but I still would like to know whether the affidavit becomes invalid through [Simon Bergmann's] death, or whether the affidavit can be inherited. Many years ago, Natorn fixed on the idea that you possessed [a] large sum [of money]. I know better; add only a (0) zero & you & I would become very happy about that. I read with a lot of sadness that you lost 10 pounds, & Martin K. is right, if he advises you to drink a lot of milk and cream. I would like to know your present weight. Please put this in your answer; don't forget it, Recha. Furthermore you have not answered my question whether Natorn's son emigrated or still remains in Zurich. Did you ask Natorn about his son, or has he told you anything about him? II. A letter on one side from Paul with a postscript from Julius in German and on the other side a letter from Julius. dem jungen Herrn Bergman Erfolg. Sei bitte so gut und übergib ihm meinen beigefügten Brief. Unsere Nummer auf der deutschen Warteliste ist über 59000; es kann noch mehrere Jahre dauern, bis unsere Nummer an der Reihe ist. Und doch ist es für uns ein Lichtblick, denn hier dürfen wir überhaupt kein Geld verdienen. Hab nochmals recht herzlichen Dank für Deine Güte. Ich wünsche Dir Gesundheit und alles Gute. Mit herzlichen Grüßen auch von meiner Frau Dein dankbarer Neffe Paul Bl. eigene Unterschrift als Zeuge angezeigt; es muß daher ein neues Affidavit ausgestellt werden. The Club founded, of course, in 1943 in London as a cultural organization presided over by such German speaking emigrants as Hans J. Rehfisch, Hermann Friedmann, Karl Wollf, and Hans Jaeger. It still is in existence today as an Anglo-German cultural forum supported by the German Embassy and holds regular weekly meetings under its indefatigable Chairman, Hans Seelig who is a retired schoolmaster and musicologist . Lilian Levy writes, "On a personal note I should like to add that I remember Paul Blumenfeld very well, though I did not know him personally; he died only a few years ago when he was well into his 90s. For many years he was a member of the orchestra at the Sadler's Wells Opera House, which at that time was the home of the prestigious English National Opera." Books. Playtexts. Photos. Promptbooks. Manuscripts. Correspondence. Programmes. Clippings. Posters. Lilian Levy also states that Paul became a naturalised British citizen on 29th April, 1948. This statement appears to be collaborated by the following record found by a search on Blumenfeld b. 12 Apr 1901 at http://catalogue.pro.gov.uk/. "On 12th April 2001, Paul celebrated his 100th birthday with his family at Balint House, London," writes Dennis. Paul died in London a short time later, on 25th April 2001. In a fitting epitaph, Paul writes, "Through his love of family and music, Paul found peace and contentment. His gentle and gracious spirit and sense of humour continued to be with him in his advanced age."